Eid al-Fitr (Ramzan Id, Eid-ul-Fitar, or Idul-Fitr) is a gazetted holiday in India.It is celebrating on 26th June 2017. We are posting top 20 Eid wishes which is trending now. 6.Jaise haste hain phool usi tarah Sada haste raho,sare gham tumeh jaye bhool,Charo taraf phalao khushion ka geet, Eisi umeed ke saath Yaar tumhe... MUBARAK ho EID. 7. When the sun has set, and day is done, I’ll break this chain, but only one but by the end of Ramadan, this whole chain will be all gone. It’s time for Eid and lots of fun! 8. As Allah waters HIS Creation, may HE also sprinkle his wonderous blessings over you and your beloved ones. 9. May your plate of life be always full of juicy kebabs and tikkas,Topped with the chutney of Happiness.With best Eid wishes, Happy EID! 10.Eid days are meant to celebrate, the goals and the achievements, that make you happiest. The ideals you believe in, and the dream you love the best. Eid Mubarak. 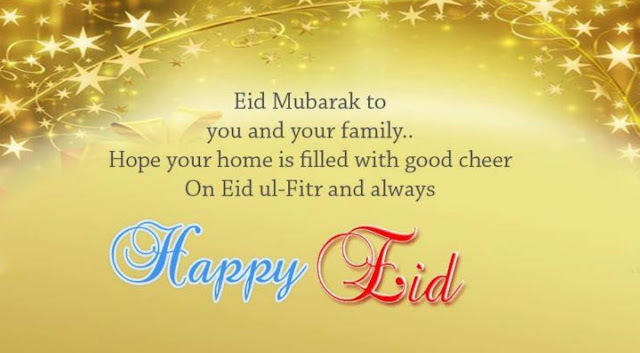 11.Wishing each other on Eid, strengthens the bond of love and brotherhood and hugging reflects forgiveness. A very blessed Eid ul-Fitr to all of you. 14. Earth can forget rotating, Bird can forget flying, Candle can forget melting, Heart can forget beating but I’ll never forget to wish You “Happy Eid” ..
15.May Allah accept our fast and continues to shower His blessings throughout the year infact throughout life, Ameen! Wish you all a very Happy Eid Mubarak!